Sat on the west coast, Pacific breezes permeating its every street, San Francisco is a capital of coffee, so packed with cafes that roast their own beans and brew their own blend that you’re never more than a couple blocks from your next beautiful cup of the good stuff, preferably black, no milk or sugar. Whittling this down to a top five was tough, there was that much selection, but if you find yourself that way on these are the places we at Shlur feel you definitely don’t want to miss. Linea Cafe (3417 18th St, San Francisco, CA 94110) – Though I didn’t get chance to visit this place myself, I’ve heard enough good things from those who know their caffeinated beverages that not mentioning it just because I missed it would be crappy of me. A nice little spot only a block or two off the well beaten track of Valencia street, I’m informed their waffles are to die for. Dandelion Chocolate (740 Valencia St, San Francisco, CA 94110) – I did manage to make it here, and boy are their hot chocolates lush. Plenty of choice flavour-wise, with a particularly nice spicy one, and some interesting cold options too. Their little chocolate nibbles, all made in house as their main factory floor and cafe share the same open warehouse space, were also exquisite. Different and unique enough a prospect to deserve mentioning as a place to visit, even if they didn’t quite choc their way into the rarefied air of the top five. Seems apt that the first coffee spot that we visited be the first on this list. Setting the tone for what to expect from the other fantastic places we visited, Sightglass Coffee offers up every variety of coffee you could ask for. Their on-site roasting equipment, mammoth and showy fenced off like some wild thing in its enclosure to your right as you enter, is a site to behold, as is their counter, piercing into the cafe floor like the prow of a ship, espresso and V60 machines lined up on either side. Their house pour makes for a particularly good flat white, working very nicely with the milk, but as with most of the cafes that made this list their best stuff is clearly in their pourovers. The choice was between an Ethiopian and an El Salvadorean when we visited, and both roasts had brought out the best flavours those regions lend themselves to. Also, for what it’s worth, the best selection of pastry out of all the cafes we frequented. The space was darker in tone than most we visited, a more industrial vibe with darker woods and exposed metalwork, but which leaves it more unique in San Francisco than its lighter, airier brethren. I imagine it to be the most inviting come winter, when those dark woods take on a warmer tone than their fairer kin. While they have three locations dotted around the city, Réveille Coffee really shines in its North Beach location. Situated across from the legendary Citylights Bookstore in the centre of the Beat Generation’s 1950s and 60s hangout, an area otherwise frozen in time through reverence and complacency, this is the place for the hipster crowd who like their coffee modern and without accompanying greasy spoons. A light, airy space, all whites and sparse black lines, the staff and the coffee are sickeningly stunning. It was one of the more relaxing cafes to spend any great length of time in, with less hustle and bustle and more of a steady stream of clientele, leaving you not feeling guilty when you hit the bottom of the mug but stuck around for an extra hour or so to doodle or take advantage of that rarest of things in San Francisco’s upper crust cafes, free WiFi. As a cafe, it really stuck in our heads, and we found ourselves wanting to go back there even though we couldn’t quite put our finger on why. Meant in the most magical, nicest sense of not knowing. This was a totally accidental find, the result of wandering around the area in search of somewhere else for breakfast, but it intrigued us too much to ignore and ultimately left a very lasting impression. Situated inside a lock-up converted into the most micro of microroasteries and café counters, Front Cafe was wonderful proof that you could open up a coffee spot anywhere in San Francisco and still do well, the demand for good quality coffee being that high. A much smaller operation than most, leaving it with a greater sense of charm, you’d be forgiven for mistaking their roaster for a barbecue from a distance. Their sleek black and chrome interior suits the space well, off-playing nicely the more exposed lock-up elements, including that classic modern bourgeois staple of exposed brick. The outside seating, situated in the shade of the hilly street’s sparse plantlife, was perfect for whiling away the hot summer hours with a foolishly hot cuppa. For the more sensible, their cold drinks offerings in their affogato (espresso poured over ice cream for those not in the know) and cold brew is some of the nicest we’ve ever had, so don’t go thinking you can’t chill while getting your caffeine fix, and drinking something lush too. This place is well off the beaten track for most things, but so worth it. And thankfully, given the overheard chatter of the other customers, it has its fair share of regulars. Taken from Samovar Tea Lounge. Samovar Tea Lounge is the odd one out here, the only cafe that does not serve coffee in any way, shape or form.The clue’s in the title for what they specialise in, which is tea. And a damn fine cup of tea it is, too. 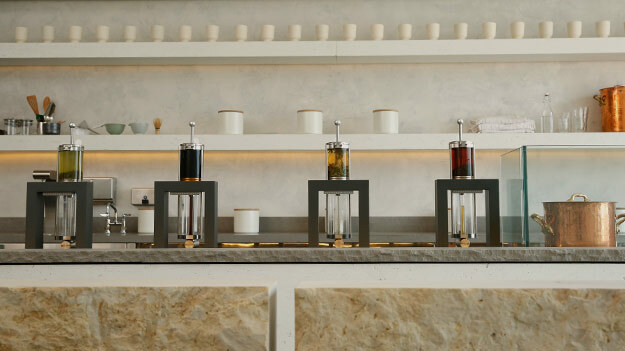 Beautiful minimal design, all whites and soft-coloured stone, with bare seating to encourage a take-out crowd lured in by the gleaming metal of their mystifying machinery, the rack of tea presses lining the counter. There is however WiFi for those who want to linger around and soak up the relaxing space. Given the uniqueness, you need staff who are willing to give each customer their time, and to their credit the staff here were some of, if not the, friendliest we met in San Francisco. They were willing to help out with tea selection, be it the winter warmer of their stunningly spicy chai lattes or their cool refreshing Rosie Palmers, chat about what you were up to and even give the odd tourist places they oughta check out. A favourite spot of mine, and one I felt myself gravitating back to repeatedly without even planning it. Must be something in the tea. This is the créme de la créme for us, the best of the best. Four Barrel Coffee‘s whole design and layout is a coffee lover’s dream. Their roastery dominates the dark recesses of the cavernous space they occupy, behind the main barista counter with its selection of cakes and your typical coffee fare, lattés, espressos, etc. What really gets us going, however, is the dedicated pourover counter, on your left as you enter. With between five to six of their own in-house roasts to choose from, on rotation based on what they got going fresh, the enthusiastic V60 jockey will happily talk you through whatever type of coffee you want. Need warming up? There’s a coffee for that. Want something more chill? That too. The variety is excellent, and with some more unique combinations of flavours on display too, a result of their constant experimenting with different washes and roasts for their beans. While on first entry this two bar system can be a bit confusing and intimidating, especially if you don’t know your coffee-brewing processes all that well, once you grasp its purpose you can’t believe more places don’t do something similar. Having the space to begin with helps as much as utilizing it as cleverly as they have, not over-cramming with tables and leaving you plenty of space to gawp around. Anywhere we’ve glaringly ommitted? Feel free to right our wrongs in the comments with other places we should’ve hit up while in San Francisco.